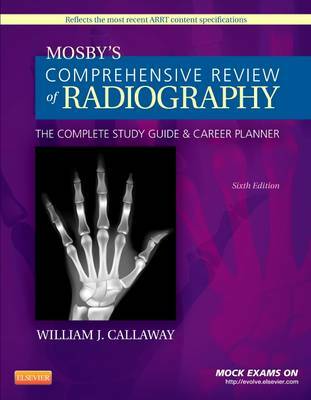 A complete review for the Registry exam, "Mosby's Comprehensive Review of Radiography: The Complete Study Guide and Career Planner, 6th Edition" covers the five major subject areas of the ARRT exam in radiography. It is also an effective study guide for many radiography courses! Written in outline format, each review of a subject is followed by questions related specifically to that area. Two mock ARRT exams are included in the book, and online exams include a pool of over 1,400 review questions that may be randomly combined to generate a virtually limitless number of mock ARRT exams. From noted radiography educator William J. Callaway, this edition also provides advice on writing resumes and cover letters, interviewing, employer expectations, and continuing education requirements to help you make the transition to a successful career.